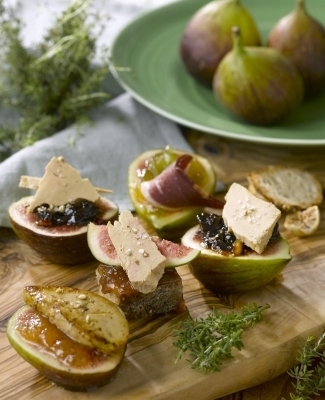 The fresh figs cut in half (or other autumn fruits) spread with chutney become the tartines. To some add slices of ready-to-eat Foie Gras, others slices of smoked duck breast, and others pan-fried Foie Gras. Cut the bread into thin slices as an accompaniment. For the slices of uncooked Foie Gras, cut to a thickness of approximately 1.5 cm and pan fry for around 3 minutes, turning several times until they are crispy and golden in colour. Season with sea salt and freshly milled black pepper. Garnish with seasonal fruits, a few salad leaves and sprigs of thyme.